I didn’t get a whole lot done in June, other than reorganize parts of the craft room. The main project I worked on was a gift for a friends 60th birthday. 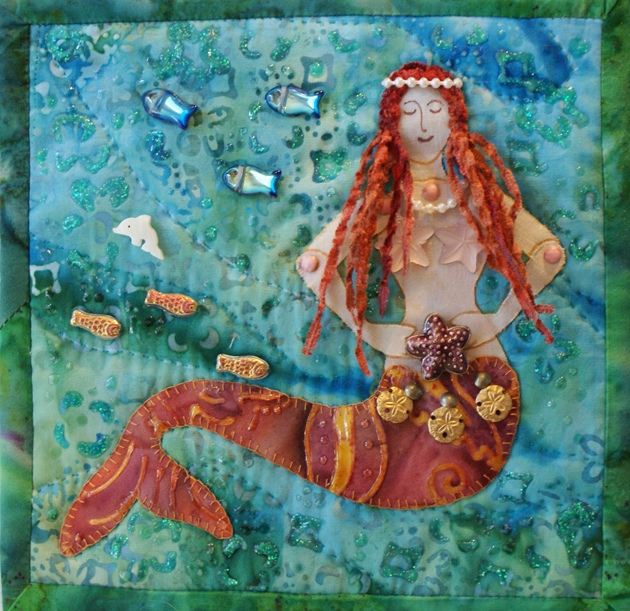 The card was made with paper in keeping with her summer birthday and the gift is because she loves mermaids. As always, click on the image for a larger view. 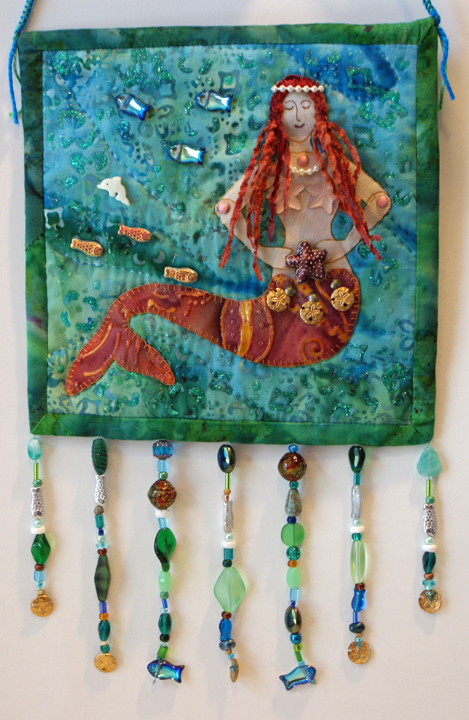 Dar’s birthday mermaid wall hanging. And last but not least, 🙂 an ATC for Sheri in the Artangle June swap. The theme was summer or “chunky” (dimensional) or both. 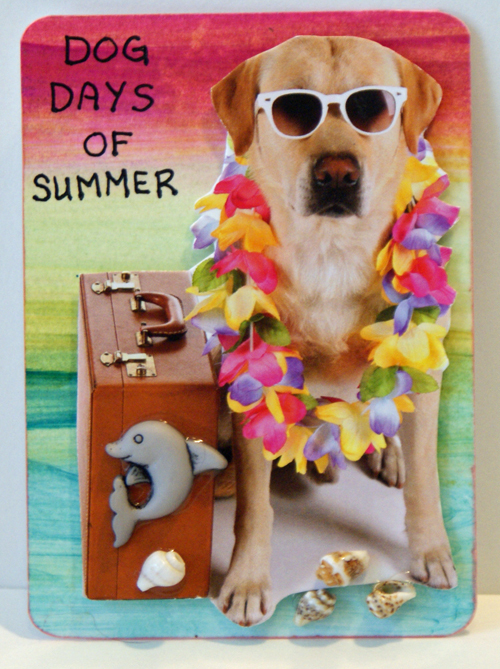 I found a cute pic of a dog dressed for vacation on an ad for Camp Bow Wow and knew exactly what I wanted to do. 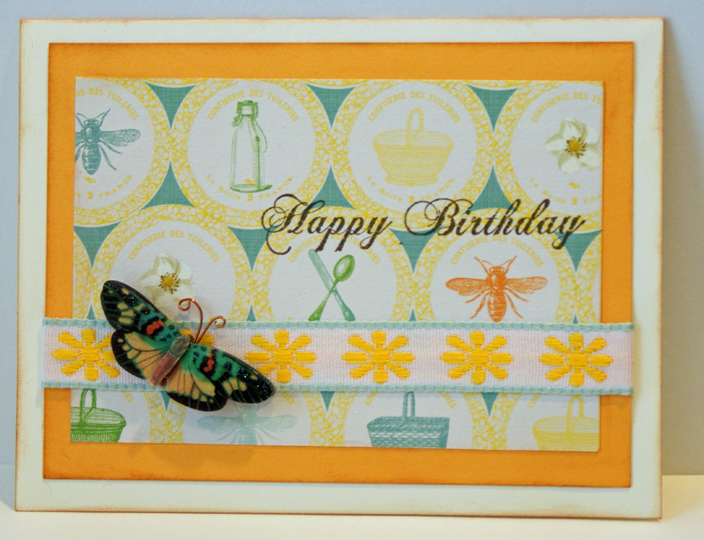 The background was made on glossy photo paper using alcohol inks and Citrasolv. So much for June, it has flown by. Thanks for visiting my blog. It seems like I’ve had some type of needle in my hand since about the age of 5. 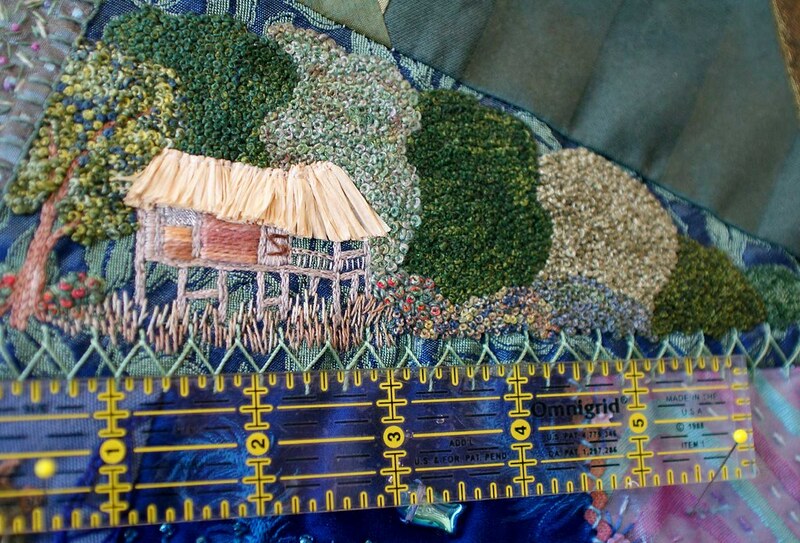 My grandmother always had some needlework project ready for my summer vacation arrival at the farm in Missouri. One year I had to make enough yo yo’s to cover a pillow and to this day I dislike making them, but I know how. Between my grandmother and my high school sewing teacher the correct way to stitch/sew something was drilled into my head, they didn’t tolerate my shortcuts. 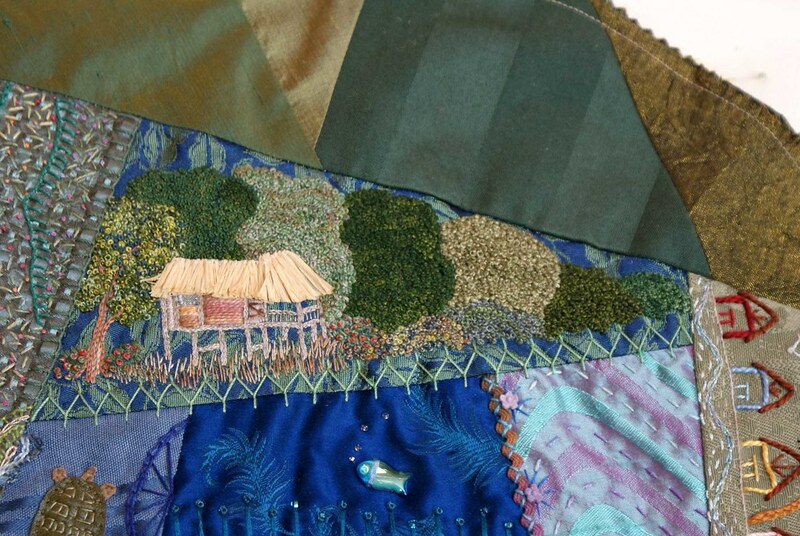 Now these days I can and do stitch in any manner I feel like, secure in the knowledge that I do know the correct way and that any shortcuts I take don’t compromise or take away from the project. OK, you’re wondering where the heck is all this information coming from? I was just sitting here remembering the summer evenings spent with grandma, sitting on the back porch at the farm, stitching, hearing the “preacher” birds and listening to the hunters and their dogs running through the woods. Noisy stitching and a quiz. The stitching around here has mostly been noise, you know the background stitching that fills in, doesn’t really stand out, but adds to the total picture. Not terribly exciting on it’s own, so no pics. 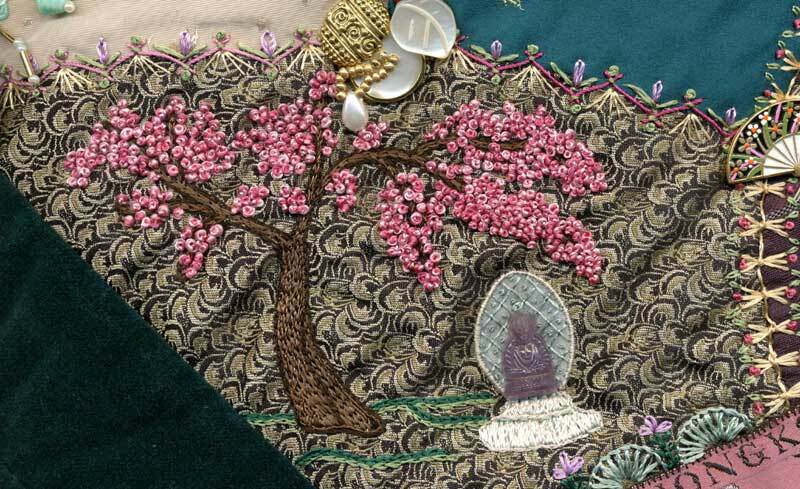 Hoping to get to more interesting stitching in the next day or so if I get caught up on things around the house. Company is coming in a couple of weeks, Hi Eve, so have to get everything ship shape. In the “that’s interesting” category, I had my eye exam yesterday and told the Dr. that my eyes kept watering all of the time. Turns out I have a bad case of dry eye syndrome, who would of thought that watering eyes meant they were dry. I’ll leave you with an interesting quiz I came across that is, in my case, surprisingly accurate.